Authorities describe many, many obvious jihadis as mentally ill, but if the information in this article is accurate, Abdulrahman El Bahnasawy may really be. Yet the two categories — jihadism and mental illness — are not mutually exclusive. It may be that he turned to Allah and jihad as a way out of his drug addiction, in hopes of tipping Allah’s great scales of judgment in his favor. It seems from the story and photo of him with his mother that he grew up in a devout household, so that was likely his frame of reference. To Khdiga Metwally, the medical records spread across her kitchen table are more than a chronicle of her son’s history of addiction and mental illness; they are proof he is not a terrorist. Abdulrahman El Bahnasawy, a 20-year-old Canadian, faces a possible life sentence when he appears in a New York courtroom as early as next month for plotting a 2016 bombing at Times Square for the so-called Islamic State. But his mother insists the case is not what it seems. “Actually, it’s not a terrorist case, it’s a mental illness problem,” Metwally said in an interview at her home in an Oakville, Ont. suburb. Those reports describe brain damage, bipolar disorder, obsessiveness and drug use beginning at age 14 that led to “huffing” — inhaling air fresheners, bug spray and anything else he could get his hands on. In many ways, El Bahnasawy’s story is familiar: a youth radicalizes online and decides to kill in the name of ISIS. But medical records from four countries obtained by Global News make it more complicated. The documents are an unprecedented and intimate look at the psyche of a young man who plotted mass killings in the West under the guidance of ISIS. And they raise complicated questions. To what extent does mental health explain the actions of some terrorists? Should terrorists with a history of mental illness be treated differently? Is a person with a mental illness, who engages in terrorism, still a terrorist? “Abdulrahman has an extensive history of mental health problems and poor function, dating back to childhood,” according to a report by New York psychologist Katherine Porterfield, who reviewed El Bahnasawy’s medical files, met his family and spent 50 hours with him over nine months in 2017. The medical records date back to the day he was born. In the delivery room in Kuwait City, his mother had a severe uterine rupture. The baby was delivered “swiftly,” according to the hospital report, but the traumatic birth may have deprived the infant of oxygen, possibly causing brain damage. “His most consistent trait was his tendency to fixate or obsess about certain topics or interests,” Porterfield wrote. The solar system, soccer, computers and atheism all monopolized his attention during stages of his childhood. And once he tried marijuana, it became the latest of his all-encompassing obsessions. He began “incessantly” talking about it. He researched how to grow it and droned on about how much he loved it. He argued with his parents about its benefits. “He essentially showed no interest in any other activities,” the psychologist wrote. To get him away from what they saw as Canada’s “permissive society,” and hoping he would benefit from being closer to relatives, his parents returned the family to Kuwait. But even in the conservative Gulf state, El Bahnasawy had no trouble finding drugs. He became addicted to chemical inhalants. When using them, he would hear a man’s voice that he thought came to him over radio waves. “He became one of my only friends and every time I wanted to talk to him I would get high and he was always there,” El Bahnasawy wrote in a letter to the judge hearing his case. 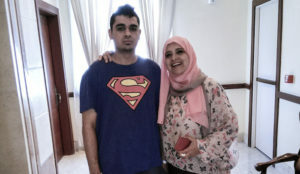 His parents got him into a Kuwait City hospital, where he was diagnosed with substance addiction and depression. To discourage him from relapsing, his father Osama El Bahnasawy videotaped him shaking from withdrawal.